Cancun, Mexico, 2019-Feb-01 — /Travel PR News/ — JW Marriott, part of Marriott International, Inc., today (01/30/2019) announced the completion of JW Marriott Cancun Resort & Spa’s highly anticipated renovation, which includes an extensive transformation to all 447 lavish ocean-facing guestrooms and suites. The hotel’s multi-million-dollar restoration will provide travelers with the highest degree of luxury service, embracing its ideal beachfront location and introducing modern elements complemented by local Mayan flair. Martha Gaos and Claudia Gonzalez of G+G Interiorismo re-envisioned the interiors of JW Marriott Cancun using a combination of modern techniques, traditional elements, and a vibrant color palette. Warm sand tones are punctuated with pops of bright turquoise that reflect the cerulean waters of the Mexican Caribbean, creating a sense of harmony with the hotel’s idyllic surroundings. Influenced by the rich culture of the destination, the hotel is furnished with pieces that incorporate traditional Mayan designs, including authentic Mexican textiles and reclaimed wood accents adorned with meticulously carved drawings, paying homage to the cross-stitched embroidery typically found in garments worn by the ancient Yucatan people. A closer look reveals intricate designs embellished with native symbols, including hummingbirds (sacred in Mayan mythology), quetzales (local birds), four-petal flowers, snail fossils, amate bark paintings derived from Mexican folk art, and other emblems common in knitting patterns of local huipiles (indigenous garments). Local artisans created the herringbone-patterned floors using traditional materials, while the hotel’s redesigned bedrooms and bathrooms feature marbled, aerial-view images indicative of the Mexican cenotes (natural sinkholes) as a striking focal point. 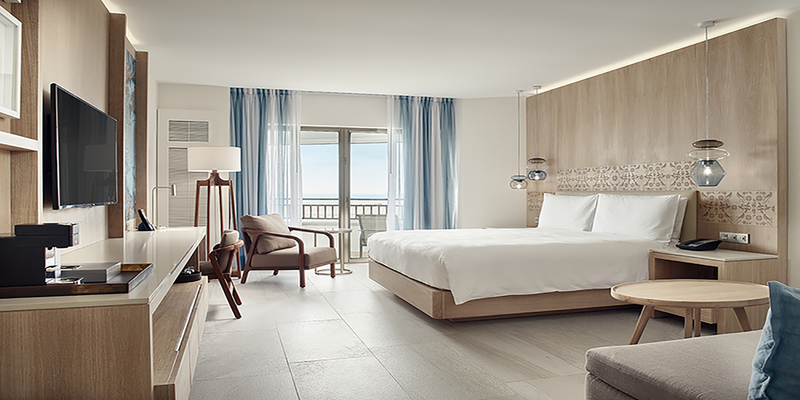 The 74 redesigned suites incorporate ‘wood screw’, a type of indigenous wood commonly used in the Yucatan Peninsula, along with architectural light fixtures, sand-colored curtains, and textured rugs in muted tones, reminiscent of the coral reefs. Additional renovation highlights include modern, oversized bathrooms with freestanding soaking tubs, luxurious rainfall showers, dual sinks, and granite vanity tops featuring chrome detailing that deliver an elevated look and feel. JW Marriott Cancun’s impressive 4,000 square-foot Presidential Suite is flooded with light and features floor-to-ceiling windows, a full kitchen and airy dining room, and is complete with beautiful oak detailing and ceramic tiles curated by renowned Spanish designer Patricia Urquiola. Designed to meet the expectations of next-generation leisure travelers, the hotel’s exclusive and updated Club 91, located on the 14th floor, evokes a mod-style that sets the scene for relaxation and socializing. The inviting new space boasts navy blue and olive-hued chairs in combination with coral reef ceiling décor, providing guests with a glimpse into what lies beyond the hotel’s shores. Club 91 also showcases exciting new interactive culinary experiences and open communal table concepts, encouraging guests to mix and mingle. JW Marriott Cancun is shaking things up with the recently debuted ‘150 Margaritas’ menu at the JW Lobby Bar. A passion project for the team’s expert mixologists and skilled tequila connoisseurs, the menu features 150 Instagram-worthy margaritas, subdivided into four categories: Classic, Modern, Fusion and Exotic. Cocktails are crafted using silver, reposado and añejo varieties of tequila, as well as mescal, with special varieties infused with exotic ingredients such as black tea, beetroot, and serrano chili peppers. Guests can experience JW Marriott Cancun Resort & Spa’s fresh Mayan-inspired look when they book the “New Point of Blue” package. The package includes overnight accommodations, daily breakfast at Sedona Grill, beach bag welcome amenity, margarita flight or tasting from the new ‘150 Margaritas’ menu, and $100 USD resort credit to use at the spa or specialty restaurants. Package rates start at $409 per night and is valid for bookings now through March 31, 2019 for travel Jan. 6 – Dec. 21, 2019. Rates are subject to a two-night minimum stay and are subject to availability and blackout dates. To book, visit www.jwmarriottcancun.com and enter code E0Q. The landmark JW Marriott Cancun Resort & Spa offers an unforgettable Cancun vacation, featuring 447 luxury rooms and suites, each equipped with private balconies that showcase views of the Caribbean Sea. For those who wish to indulge themselves, Club 91 offers the sophistication and exclusivity of a private club, with access to the resort’s full range of luxury amenities and services. The JW’s Mayan-inspired spa is rated one of the top spas in Mexico and offers massages, body wraps, manicures, pedicures and more. With world-class restaurants, expansive meeting space and the stunning beauty of the Mexican Caribbean, the JW Marriott Cancun Resort & Spa is an ideal choice for corporate retreats, events, romantic getaways and family vacations. For more information or to book a reservation, please visit www.jwmarriottcancun.com or call 1.800.223.6388. This entry was posted in Business, Hospitality, Hotels, Luxury, Resorts, Travel, Travel Management, Travel Services, Travelers and tagged Cancun, Christopher Calabrese, Claudia Gonzalez, JW Marriott, Marriott International, Martha Gaos, Mitzi Gaskins, restoration. Bookmark the permalink.